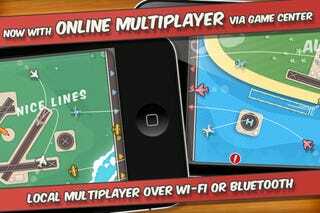 Flight Control, the uber-popular iPhone game, recently got an update on iPhone and iPod Touch to include online multiplayer through Game Center. The new multiplayer mode (already available on iPad) is just as addicting as the single player: you land either red planes or blue helicopters and yellow planes and send the planes you don't land off the screen and to your partner. The trick is communicating with your partner to make sure they dont crash what's coming to them.